The Phantom of the Opera 1925. 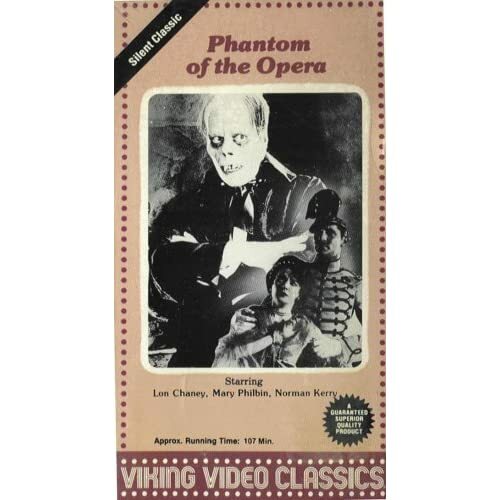 The Complete Resource for The Phantom of the Opera 1925 Movie. On September 6th, 1925 Universal Pictures released the feature film The Phantom of the Opera based on the novel Le Fantôme de l'opéra by Gaston Leroux. 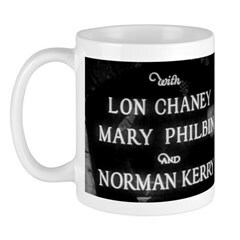 This is the complete source site for the classic black & white movie starring Lon Chaney, Mary Philbin & Norman Kerry. 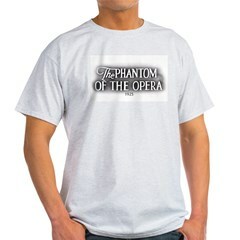 Extensive use of photographs from the film and merchandise you will find nowhere else make this a Phantom fan's must. Touted as being The greatest horror film of modern cinema!, The Phantom of the Opera 1925 is definitively a cinematic classic. The tale of making the movie is just as classic, with numerous directors involved, repeated re-shoots, added and deleted scenes, two previews and a pre-premiere before what is now considered the official release date. The numerous versions of this movie make it confusing to follow its history in the cinema. This article simplifies the order of events with what is now known. In the beginning... there was the building of the famous Paris Opera House on Universal's Stage 28. A major undertaking of steel and concrete. A structure that has lasted down to our day. The script went through numerous versions as did the movie itself (explained below.) You'll enjoy reading the fifth revision of The Phantom of the Opera 1925 screenplay as it looked around October/November 1924. I've inserted pictures from the final film which makes it more enjoyable to read. Shooting began October 29th, 1924. A series of directors were used including Lon Chaney himself, though not credited. 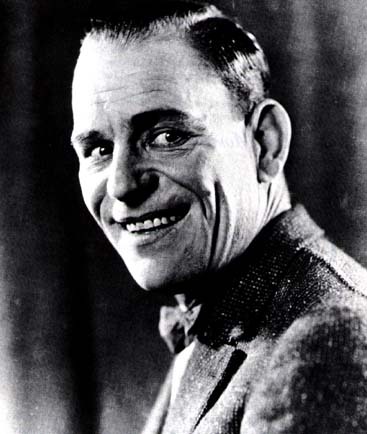 Lon Chaney's self applied makeup was a cinema secret. The "Man of a Thousand Faces" created his most memorable and enduring character, The Phantom of the Opera, in the confines of his dressing room. Various eyewitness reports mention wire hooks or bobby pins, grease paint, tape, wax and more in creating his character. Chief cinematographer Charles Van Enger, A.S.C. said that the chandelier scene was done with stop motion to keep the cast below safe. There is at least one article on the Internet that says it was done in reverse, pulling the chandelier upward, then developed backward in the lab. Van Enger's description is found in the great book The Phantom of the Opera (Hollywood Archives Series) (v. 1) by Philip J. Riley and so I am inclined to go with that explanation. There were scenes that were originally filmed in the two-color Technicolor process. Two of these were the masquerade ball (or Bal Masque) and the scene where the Phantom is on the rooftop. In this scene his cloak was hand-painted in crimson. The only print that remains of that scene is now in black and white. 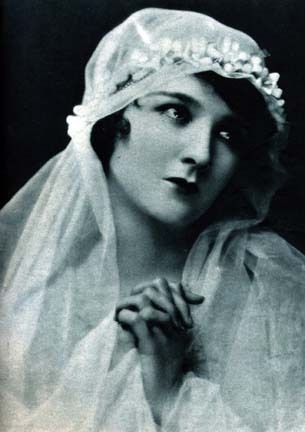 The movie was previewed on January 7th and 26th, 1925 in Los Angeles, California. After poor reaction from the public the director, Rupert Julian, was told to re-shoot the movie. He thereafter walked out. The producer Carl Laemmle then brought in director Edward Sedgwick and new scenes were added. On April 26th, 1925 the new version of the movie was shown at the Curran Theatre in San Francisco, California. This was referred to as the World Premiere. It still was not satisfactory. Scenes were added and others scrapped. It was then finally shown at the Astor Theatre in New York, New York on September 6th, 1925, and the following month in Hollywood, California on October 17th. Its general release was on November 15th, 1925. Reviews say that some moviegoers fainted during the Phantom's unmasking scene. A reissue brought significant changes. Universal released this new version of their $2,000,000 grossing silent horror film on December 15th, 1929. Nearly half of that version was re-shot, this time with sound using the Western Electric Vitaphone sound-on-disk sound system. 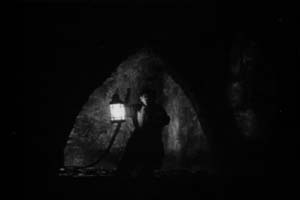 That version opened with a man in the catacombs below the opera house holding a lantern and giving a prologue. It hasn't been determined what the man is saying in this scene. The soundtrack has since been lost and the man with the lantern is now mute. 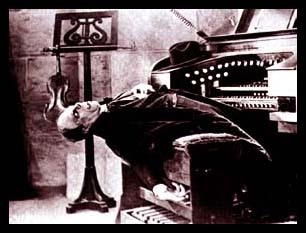 On page 11 of Philip Riley's book (mentioned above) he says that what we have now "is actually a silent version of a 1929 dubbed sound reissue, which is missing at least 35 minutes of development scenes, opera scenes, titles, and some of the best atmospheric photography and set designs in motion picture history." With this release another million dollars was grossed by Universal. 1930 brought an international version also with significant changes in editing and titles. 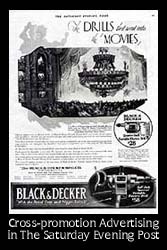 As is the case today, merchandising and advertising was very important to the success of The Phantom of the Opera in 1925. Products were either created for or created around the buzz. Ad campaigns would be devised by manufacturers in order to have their products get carried along with that success. Universal went to great lengths to promote the movie. One example: The Hammond Lumber Company in Los Angeles delivered the wood used in building the replica of the opera house. Coming to and from the construction site the trucks displayed a sign stating "The Largest Shipment of Lumber for the Upcoming Production of Phantom of the Opera". There were posters and ads in magazines. A Phantom of the Opera souvenir booklet exists out there somewhere. There was a stereoscopic photo set, "Phantom Red" milk shake's. Saks - Fifth Avenue promoted "Phantom Red Velvet Evening Pump" shoes. 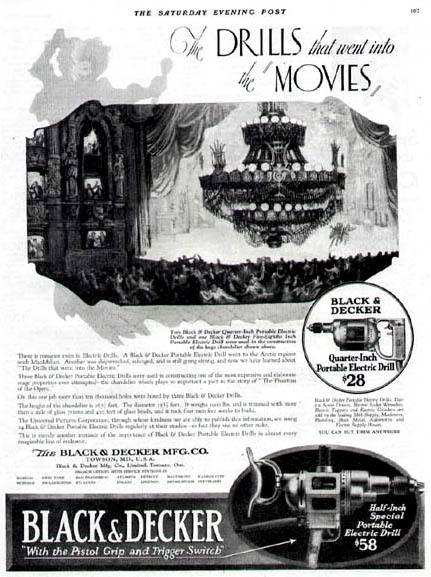 There were the products cross-promoting themselves with the movie, such as the Black and Decker Advertisement you see here. 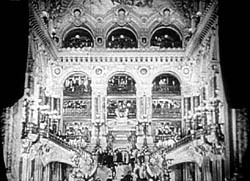 A new edition of The Phantom of the Opera by Gaston Leroux was published which included photos from the motion picture. The list is too long to write it all here. And is it just a coincidence that Rolls-Royce changed the name of their Silver Ghost automobile to the Phantom in 1925? 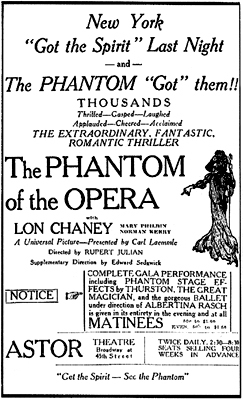 The Phantom of the Opera 1925 movie was based on a novel that had been out for about 15 years, being published in 1910. That novel was Le Fantome de l'opera by Gaston Leroux. The story is a dark one. At the Paris Opera a demented figure lurks in the shadows. He takes his place in box 5 and peers down upon the crowd. His young student Christine Daae is singing tonight. All part of his master plan to have the young lady he loves famous in Paris. He has frightened the prima donna Carlotta into bowing out of the lead of playing Marguerite in Faust. How? By various letters sent from the mysterious Opera Ghost, signing them The Phantom. Opera Ghost aside, the Paris Opera House was, and is, a real place. And this is the location that Gaston Leroux based his novel. Other than the Phantom, the main characters in the story include Christine Daae and Raoul. One of the most memorable parts in the book are the events surrounding the masquerade. Phantom enthusiasts and those who have never seen the 1925 movie are familiar with Lon Chaney, wearing the mask of the Red Death descending the staircase at the Phantom of the Opera masquerade ball. There have been many retellings of The Phantom of the Opera on stage and screen, but no one tells the story better than Gaston Leroux. Phantom of the Opera is still a great seller, moving many copies every year from bookstore shelves. You can go to the Temescal Valley Public Library Web site if you'd like to read the novel The Phantom of the Opera by Gaston Leroux online. Lon Chaney Sr., not to be confused with his son Lon Chaney Jr., starred in such horror classics as The Hunchback of Notre Dame, The Phantom of the Opera and London After Midnight. Gaston Leroux created iconic characters and scenes that will not soon be forgotten, such as the Phantom of the Opera, Christine Daae, the masquerade from Phantom of the Opera, the prima donna Carlotta and the Red Death. There have been plenty of movie related products available over the decades using these scenes and characters. There is plenty of merchandise from the Andrew Lloyd Webber musical version, but how about the 1925 movie version? What products are available? Where can you get them? There's plenty for fans on this page with links to cool products - posters and prints, inexpensive action figures and world-class top-dollar ceramic figurines. Picture books and T-shirts, DVDs, VHS tapes, the soundtrack on CD - there's an abundance for the collector and the casual fan. Let's look at a few of them. To begin with, how about the movie itself? For fans or curious passers-by who want to watch it, The Paris Opera House Theatre airs the program 24 hours a day. If you don't mind waiting a few days for shipping and you'd rather watch the film on your TV or big screen, there are many DVD and VHS versions available. If you decide to purchase one, by all means get The Phantom of the Opera - The Ultimate Edition (1925 Original Version and 1929 Restored Version). This one includes the original 1925 version as well as the restored 1929 version, the original Vitaphone soundtrack, an image gallery featuring deleted scenes from the San Francisco and Los Angeles premieres, trailers from 1925 and 1930 and so much more. The original movie was promoted with posters. Those posters have been reproduced by many different companies and are still hot sellers after all these years. 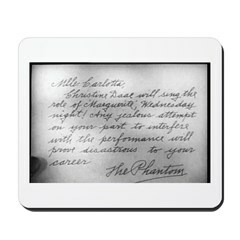 You can Buy Phantom of the Opera posters and prints at Art.com or find More Great Posters From MovieGoods.com. But maybe you're the type that likes to look at the books related to the movie. Full of rare photos and behind the scenes info? Maybe even a copy of the script or press book included? It exists. Phantom of the Opera: The Original Shooting Script has all of these and more. It's the perfect companion to the Ultimate Edition DVD, no doubt about it. This book has 320 pages and over 250 rare photos. The preface is written by Ray Bradbury with a forward by Mary Philbin. The introduction is by Ron Chaney, great-grandson of Lon Chaney Sr. The Phantom of the Opera: The Original Novel in paperback can be found for hardly nothing and is an engrossing story that, like all good movies, is deeper and richer than the filmed version. Or, let's say you just don't have the time to read a paperback. The perfect thing for you would be an audio book. Something you can listen to on that long drive to and from work. Get the audio book With 10 hours on 7 CDs unabridged will make your long commute bearable. 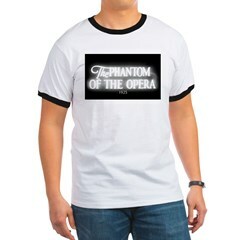 The Opera Phantom Gift Shop has a few products that I think you will find unique. They are images taken from the movie and put on different things like postcards, mugs and hats. 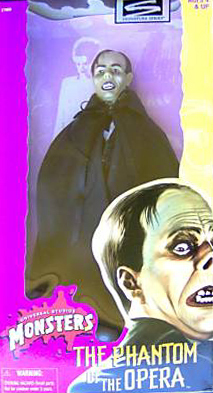 Sideshow Collectibles even makes true-to-the-movie collectible statues of Lon Chaney as The Phantom of the Opera. It's even painted in black and white to match the mood of the 1925 movie. 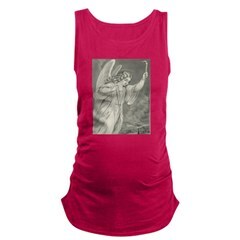 You may need to get on a waiting list for one though as they sell out very quickly. The banner below has a link to their Web site. Hand painting your own Phantom models even has its own following, as this link to The Clubhouse Modeling Community shows. 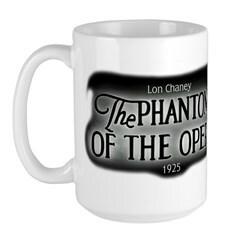 I told you there were still great products for The Phantom of the Opera 1925. In conclusion: Whether or not The Phantom of the Opera 1925 is the greatest Phantom movie ever is subjective. 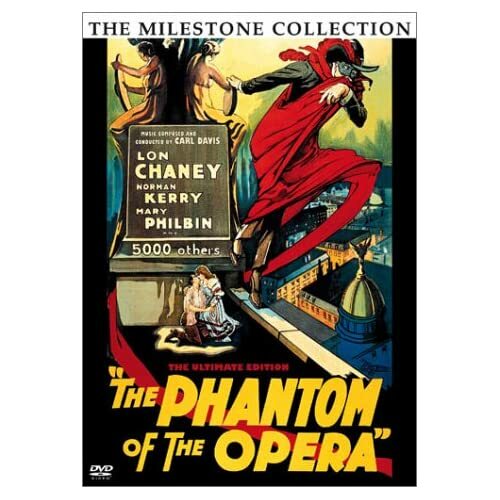 One thing is certain though: Its enduring popularity proves that no other version comes close to the original Lon Chaney Phantom of the Opera from 1925. Give us notice of your quality Phantom 1925-related page and you may be awarded a link from this Web site along with an e-mailed "Phantom Certified Recommended Site" digital certificate to display on your page. 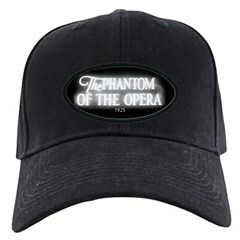 Feel free to use our banner on your Phantom of the Opera 1925 Web page. High Medium Low. © A BETTER SURFACE. All rights reserved.